In February 1976 was published Star Trek Log Six, another entry in Alan Dean Foster’s series of adaptations of Star Trek: The Animated Series. This would be the last book in the series to adapt three episodes; the remaining four episodes would be expanded to fill an entire book each. I anticipate that those books will be more interesting, but time will tell. For now, let’s look at the three stories in this book: “Albatross”, “The Practical Joker”, and “How Sharper Than a Serpent’s Tooth”. On a routine diplomatic mission, Dr. McCoy is unexpectedly arrested. The charge: genocide. He is accused of causing a plague on Dramia II, either through incompetence or malice. His shipmates must try to find proof of his innocence before it’s too late. This is an entertaining enough read, but it’s got a few flaws. The biggest is this: Spock arranges for the ship to self-destruct in order to prevent the spread of the plague, and then beams down to Draymia to effect a jail-break. The plague is almost invariably fatal, appears to kill within hours of infection, and has not been cured in decades of research, but he is prepared to gamble that Dr. McCoy will be able to manage a cure in the few hours before the entire planet’s population is killed? When McCoy calls attention to this, Spock replies that he “felt justified in taking a calculated risk.” Inconceivable! Besides that, every doctor that ever worked on curing the plague must have been carrying the idiot ball, since they somehow failed to discover the its cause, which McCoy managed by simply asking the computer what could have caused most of its symptoms. The ship’s computer gets ‘sick’ from passing through a weird energy field, and starts playing increasingly dangerous practical jokes on the crew. Meanwhile, some Romulans intend to capture the Enterprise. The most interesting parts of this dull story are the unimportant bits thrown in to give it some color. As an aside, my copy of this book also has an astounding misprint–an entire line printed on the wrong page. The quality of editing in these books is pretty bad, to begin with, but this is a new low. Kukulkan, a winged snake, kidnaps Kirk, McCoy, Scotty, and Ensign Walking Bear, and intends to destroy them–and the remainder of the Enterprise crew–if they cannot satisfy him. He is revealed to have visited Earth many years ago, giving Mayans their famous calendar, and similarly influencing other cultures. He wishes for humans to worship him, and in return he will guide them, but it is not to be. As Kirk says, “you cannot have intelligent slaves”. They will not stand for it. A mediocre story. Essentially not so different from “Who Mourns for Adonais?”, which revealed that the Greek gods were aliens, and a similar concept was on display in “The Magicks of Megas-tu”. This story doesn’t really do anything with the premise, though; Kukulkan is just a generic threat to the Enterprise, and he gets perhaps a page of characterization before the story ends. Kirk and the others get a chance to show–again very briefly–that humanity has moved beyond its savage past, but little is made of it. If Kukulkan really was instrumental in shaping the fate of humanity, why didn’t that get some focus? Disappointing. All the stories are competently done, but they don’t offer anything substantial to keep the reader’s attention–no new insights or interestingly different takes on the episodes. It makes me long for the previous book: “The Ambergris Element” opened with a look at M’ress as she decided to enter Starfleet and moved up through the ranks, and it was wonderful. We need more of that! I’m hoping that we’ll get a lot more such asides in the remaining books in the series, since much more material must be created to expand the episodes into novel-length stories. This is another book that is probably of interest only to completionists. So far in our journey through treklit, we’ve seen a lot of adaptations, several nonfiction books, and even a novel or two. Now we come to a new kind of book: a reference book, presented as a non-fictional item from the fictional universe. Today’s subject is the Star Trek Star Fleet Technical Manual by Franz Joseph, published in November 1975. This book was preceded by the Star Trek Blueprints by the same author, published in April of the same year, which I do not presently have access to. 40 Eridani is the Vulcan star system, 61 Cygni the Tellarite system, and Epsilon Indii the Andorian system. The Articles of Federation are followed by the peace treaty with the Romulan Star Empire, then the peace treaty with the Klingons imposed by the Organians. After this are many pages of diagrams: the flags of the members of the Federation, patterns for uniforms, schematics for equipment, blueprints for buildings, everything you could wish for. On the whole, this book is probably better as a sourcebook for Trek-related creative endeavors than as a standalone book. In July 1975, five months after the publication of the previous volume, was published Star Trek Log Five by Alan Dean Foster. This volume, as usual, adapts three episodes from Star Trek: The Animated Series: “The Ambergris Element”, “The Pirates of Orion”, and “Jihad”. The blurb on the back of the book for this story reads: “Marooned on the strange water world of Argo, Kirk and Spock are in incredible danger . . . pursued by a hideous sea monster!” That is only accurate in the most approximate sense. There is a water world, and a sea monster, but Kirk and Spock aren’t marooned and the story isn’t about a sea monster chasing them. Rather, a sea monster attacks their submarine and they’re injured. The water-breathing natives find and heal them, mutating Kirk and Spock into water-breathers as part of the process. The story is about Kirk and Spock attempting to return to normal, hindered by the cultural traditions of the aliens, but aided by some of the younger aliens, who are willing to ignore the old traditions to do what’s right. The blurb does not do the story justice. This is a good story, and Foster improves on the episode. An altogether satisfying adaptation. Spock has contracted a deadly illness, and the only cure has been stolen by pirates. Kirk must catch them and retrieve the medicine before it is too late. Like many of these stories, the tension is provided by what amounts to a timer counting down. In this case, Spock’s life is on the line, and to be fair it is interesting to see how affected Kirk is by the situation, but ultimately the plot isn’t interesting. Kirk and Spock, along with several others of various species, are tasked with retrieving a religious artifact stolen from the Skorr before they declare war on the rest of the galaxy. The group must work together in a hostile environment where all previous efforts have failed. The plot of this story is unsatisfying. It feels like the group just wanders around, stumbling from danger to danger, until finally they discover the artifact, survive the climactic encounter, and the story ends. There’s no particular buildup; the story doesn’t go anywhere so much as it churns in place for fifty pages and then spits everyone out the other side. “The Ambergris Element” is the only worthwhile story in this one. The writing is good, as usual (though my edition, at least, is positively riddled with typographical errors), but it isn’t enough to save the other two stories. Published in April 1975, Star Trek 11 was the last entry in that series completed before Blish’s death. Star Trek 11 contains adaptations of six episodes: “What Are Little Girls Made Of?”, “The Squire of Gothos”, “Wink of an Eye”, “Bread and Circuses”, “Day of the Dove”, and “Plato’s Stepchildren”. The Enterprise investigates the planet where Dr. Roger Korby, who incidentally was Christine Chapel’s fiance, disappeared several years ago. They find him working on a technology that can make lifelike androids and even transfer a human’s consciousness into an android. He wishes to use this technology to build a better society, free from want or hate–but is it really better? Michael Strong’s performance as Korby in this episode was quite good, but Blish eliminates some unfortunate things like Ruk’s “That was the equation!”. I’d say this is of comparable quality to the episode, overall. An enjoyable adaptation of a good story. The Enterprise finds a planet on which resides a strange and powerful alien, Trelane, who is very taken with Earth–the Earth of nine hundred years prior, that is. Trelane, styling himself the Squire of Gothos, forces them to dance to his tune for his amusement, while Kirk searches for a way to escape his power. Surprisingly, this is pretty good even without William Campbell’s excellent performance–perhaps because I’m reading all of Trelane’s lines in his voice. The Enterprise, responding to a distress call, finds an empty planet. It turns out to be populated by people who experience time at a fantastic rate, making their movements far too quick for the crew of the Enterprise to perceive. The same disaster that caused their immense acceleration also rendered their men all sterile, so their queen, Deela, has taken the Enterprise in order to have Kirk as a mate. Not too bad, but not great. A substantial part of the appeal of the episode was in seeing the non-accelerated members of the crew frozen in time, but the adaptation doesn’t convey the same feeling. The Enterprise finds a planet that has developed remarkably similarly to Earth, except that it is ruled by a modern version of the Roman empire. This is cited as an example of Hodgkin’s Law of Parallel Planetary Development–utter nonsense, of course, and not even consistent with other episodes. As with “Wink of an Eye”, above, and as I said of “A Piece of the Action” in my review of Star Trek 4, much of the good in this episode was in the seeing, so the adaptation isn’t as interesting. The crew of the Enterprise and of a Klingon ship are brought together by an energy being that feeds on hatred. They eventually drive it off by laughing at it. That summary sounds pretty bad, but it’s a fairly good story, really. Incidentally, this is the first appearance of Kang, who later figures into stories in DS9 and Voyager. The Enterprise, responding to a distress call, finds a planet where the thirty-eight inhabitants have psychokinetic powers. Their leader Parmen, who is gifted with the strongest power, is ill, and McCoy must save him. Once restored, Parmen is unwilling to let McCoy go–and in any case secretly intends to destroy the Enterprise rather than allow them to leave with knowledge of the planet’s location. This episode didn’t have much going for it other than watching the actors pretend to be moved by external forces–including the famous kiss between Uhura and Kirk. The theme is simple: power corrupts. The plot resolves conveniently and Kirk rides off into the sunset. This volume has a few good stories, and a few middling ones. I don’t know if Blish’s writing is stronger in this one, or if absence has made my heart grow fonder (it has been about two years since my review of Star Trek 10, after all), but I think even the lesser stories were pretty enjoyable. If novelizations are your thing, Star Trek 11 is a good entry in the series. Another day, another book of adapted cartoons. In February 1975 was published Alan Dean Foster’s fourth book of Star Trek: The Animated Series novelizations, imaginatively titled Star Trek Log Four. This volume contains adaptations of “The Terratin Incident”, “Time Trap”, and “More Tribbles, More Troubles”. The Enterprise receives a strange transmission in a long-obsolete code, the only intelligible word of which being ‘Terratin’. When they go to investigate, they are hit by a strange light, which destroys their dilithium crystals and–it turns out–causes the crew and all organic material on board to begin to shrink. They must find some way to fix things before they become too small to operate the ship. This story is filled with interesting asides, satisfying bits of trivia about the characters, and an utter lack of developing plot. Just page after page of “and they got a bit smaller, so they had to rig up an extra-long pole to reach the coffee pot”, until finally they get to the end of the story and things are explained, and they solve the problem by sending everyone through the transporter to return them to their natural size. Exploring a weird section of space, the “Delta Triangle”, a futuristic analog of the Bermuda Triangle, the Enterprise is attacked by a Klingon ship which promptly vanishes. Then they escape from that ship’s compatriots by following it through a pothole in space to a pocket dimension called Elysia where, for some reason, people don’t age and dilithium quickly degrades to uselessness (unreliable stuff, apparently). This is another story in which there is precious little plot. The Enterprise gets stuck, so they glue it to the Klingon ship for an extra boost, and the problem is solved. The people living in Elysia exist pretty much solely for the sake of communicating to Kirk a last minute warning about a Klingon plot. The Enterprise, escorting ships carrying grain, encounters a Klingon ship chasing a small Federation vessel. They beam the pilot aboard just as his ship is destroyed, and what do you know, it’s Cyrano Jones, out selling tribbles again. This time, instead of reproducing rapidly, they just grow to immense proportions. Oh, but actually they still breed explosively, too. So… yeah. Tribbles, again. They beam them over to the Klingon ship, again. This is just not a good selection of stories. If it’d been just one or even two of them that were very light on plot, it’d be bearable, but for all three to be so mindless? It’s pretty bad. The writing is as good as usual, though, and Arex gets a fair bit of ‘screen time’ throughout, which is nice. The show could really have done with some more focus on the non-human (and non-vulcan) crew, so it’s good to see the novelizations correcting that. Even so, I wouldn’t recommend reading this one unless you’re a completionist. 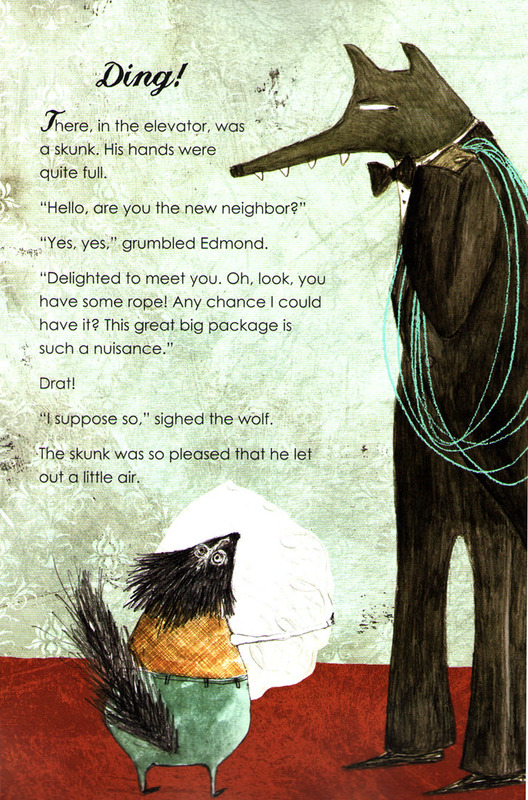 One Sunday morning, Edmond Bigsnout, lone wolf, left his home in the woods with a great big knife in his paw. Edmond had a hankering for some rabbit. Not just any ordinary cottontail, though. What he craved was a grain-fed, silky-haired rabbit, one with just a hint of sweetness. A city bunny. Edmond finds an apartment building where a likely meal lives, but forgets his knife in the elevator (where it’s found by another resident of the building, who was in need of a knife). No matter, he thinks, and returns to his home, this time retrieving a chainsaw. But when he gets back to the apartment building, he encounters a bear who mistakes him for a new tenant, and just so happens to need a chainsaw. Edmond lends the bear his chainsaw and returns home for yet another tool… and so it goes. Eventually, Edmond has provided all the necessary tools for a rooftop party. If you can’t beat them, join them, so Edmond moves to the city and becomes a vegetarian–and president of the Good Neighbor Association. When a Wolf is Hungry a a fun little story. I think I’ve usually enjoyed stories with wolves–Walter the Wolf by Marjorie Weinman Sharmat, or The True Story of the 3 Little Pigs! by Jon Scieszka, for example–I wonder if there’s some connection? The art is very nice (you can see some more samples of it on the artist’s web site)–it reminds me of I Want My Hat Back, a bit–and the story is satisfying. When a Wolf is Hungry was originally published in France in 2011, and will be published in English by Eerdmans Books for Young Readers on 2017-08-07. It is recommended for ages 4 to 8. Disclosure: I received this book for free in exchange for a review. Continuing, after quite some delay, my series of reviews of Treklit, we come to Alan Dean Foster’s Star Trek Log Three, another in his series of novelizations of Star Trek: The Animated Series. This volume contains adaptations of “Once Upon a Planet”, “Mudd’s Passion”, and “The Magicks of Megas-Tu”. This story is a sequel to the TOS episode “Shore Leave”, in which the Enterprise happens upon a ‘shore leave planet’ that is designed just to satisfy, as Kirk noted, the need of complex minds for the simplicity of play. The Enterprise has been overtaxed, lately (the stories in these novelizations are written as taking place in sequence), so Kirk asks for something special in the way of reward for the crew, and he gets it: approval for shore leave on the Shore Leave Planet, in the Omicron region. Upon arriving, Uhura, Sulu, and McCoy beam down together and note that everything seems to be as it was when last they saw the planet, down to the appearance of Alice and the White Rabbit. They go their separate ways in order to enjoy their own–private–fantasies, but McCoy has scarcely come into view of the Southern mansion he dreamed up when he is set upon by armed playing cards, straight out of Alice, who attack him in deadly earnest. He manages to call for an emergency beam-up just in time to escape them. Shore leave is canceled as the crew of the Enterprise strive to determine why the planet is attacking, why the Keeper didn’t intervene, and what has happened to Uhura, who has vanished without a trace. This story is pretty good, and translated well by Foster. Cutting shore leave somewhat short, the Enterprise is ordered to investigate the activity of an old ‘friend’, Harry Mudd, who we last saw in “I, Mudd”. He is up to his old tricks, swindling people far and wide. This time, he’s selling a love potion. This story is very thin and no better for Foster’s efforts. The Enterprise is sent to investigate the unusual phenomena at the center of the galaxy, including a ‘negative black hole’ busily ejecting matter, which they presume to be the source of all matter in the galaxy, drawing its energy from a multitude of other universes. Then they begin to be drawn into a cone-shaped vortex which is drawing in–and destroying–matter, from which the Enterprise cannot escape. They gamble that it may be safer in the center of the vortex, and, passing through it, they find themselves in another place, strange to them, operating by no known laws. Lucien introduces the to the planet Megas-Tu, where the physical laws correspond to what the humans would call magic. His people had ventured out of their own universe before and encountered Earth, but their welcome had not been so warm. When others of Lucien’s people discover the humans, they quickly put them on trial for the crimes of their species, as exemplified by the Salem witch trials, in which, weakened by the distance from their own world, the Megans were persecuted and even burned. Kirk argues that if humans were once so savage, they have changed, and continue to strive to change, to be better and more noble. The Megans accept that this may be so, but declare that Lucien still must be punished for bringing the humans to Megas-Tu. Kirk defends him, as well, accusing the Megans of being as cruel as they accused the humans of being. In so doing, he passes a secret test, proving by his concern for Lucien, known also as Lucifer, that humans truly have changed. Should humans again visit Megas-Tu, they would find a warmer welcome. The author of this episode, Larry Brody, indicated that originally, the Enterprise was to meet God out in space, but that idea was nixed by the censors. But meeting the Devil in space was fine, and so the episode was born. This episode must have been influential, indeed. In the first episode of Star Trek: The Next Generation, “Encounter at Farpoint”, Q puts the crew of the Enterprise on trial for the crimes of humanity, and Picard, too, argues that Q should consider whether humanity is presently as savage as in times past. Then in “Where No One Has Gone Before”, the Enterprise is taken to the edge of the universe, and find it a strange place where reality is impacted by thought. Then, in Star Trek V: The Final Frontier, the Enterprise (under Kirk’s command, this time) visits the center of the galaxy, where they find a godlike being who turns out to be evil. The first and last stories in this are quite good, though the middle one is forgettable. That’s a pretty good ratio for novelizations of television episodes. “Once Upon a Planet” is perfectly like any Trek episode you’ve ever seen, and “Mudd’s Passion” is like most of the bad ones. “The Magicks of Megas-Tu” isn’t a top-tier story, but it’s pleasant enough, and interesting in how it presages later Trek. If you’re a Trek fan looking for a little light reading, this book isn’t bad. My aim has been to give a rendering of the Iliad which will convey the meaning of the Greek in a speed and rhythm analogous to the speed and rhythm I find in the original. I must try to avoid mistranslation, which would be caused by rating the word of my own choice ahead of the word which translates the Greek. Subject to such qualification, I must render Homer into the best English verse I can write; and this will be in my own “poetical language,” which is mostly the plain English of today. So, what’s this Iliad thing all about, then? In short, when the story begins, the Trojan war has been on for nine years. Chryseis, the daughter of a priest of Apollo, has been captured by Agamemnon, and he quite rudely refuses to ransom her back. As a result, Apollo punishes the Achaians. To placate Apollo, Agamemnon agrees to return Chryseis to her father, but only if he is given Achilles’ captive, Briseis, in her place. This offends Achilles greatly, so he asks his mother, Thetis, to entreat Zeus to punish the Achaians in order to demonstrate his worth. The bulk of the epic is a description of the battles between the Greek forces (particularly a few main actors such as Agamemnon, Odysseus, Diomedes, Ajax, and Nestor) and the Trojans, led by Hector, over the course of which the Achaians are pushed back to their ships, as Achilles begged of Zeus. Afterward, Achilles’ friend, Patroklos, is killed by Hector, and Hector is in turn killed by Achilles. When the epic ends, the Trojans have been driven back into their city, which is yet uncaptured, and Achilles, though still alive, is soon to die. The story is usually entertaining, but there are several sections which present the genealogy of some character or other, which I found to be of little interest, and the battles are often long strings of “Foo, son of Bar, beloved of Zeus, was struck by the spear under the nose, and it pierced through. The darkness closed over both eyes, and he fell to the ground, thunderously, and his armor clattered upon him.” Even bloody battles can be made dull by too much of this. comes to the fighting, her at least you may stab with the sharp bronze. You archer, foul fighter, lovely in your locks, eyer of young girls. your bow would do you no good at all, nor your close-showered arrows. Now you have scratched the flat of my foot, and even boast of this. had struck me; this is the blank weapon of a useless man, no fighter. rots away, and there are more birds than women swarming about him. Lattimore’s translation is generally very easy to understand, though his choices for writing names can take some getting used to: he renders Ajax as “Aias” and Achilles as “Achilleus”, for example. The direct, unpoetical language has its benefits, I suppose. The translation is never confusing by fault of overly florid language. But all the same I find myself a little disappointed how much it reads like ordinary prose; I enjoyed the more lyrical style of Cowper’s translation, though it was a bit harder to follow. Overall, I enjoyed the Iliad and was satisfied with Lattimore’s translation. Even if it weren’t an important work of literature, I think the Iliad would still be worth reading. It’s not a quick read, by any means, but it needn’t seem intimidating, either. If the Iliad is on your reading list, go for it!